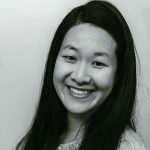 Published Apr 21, 2017 By Julia 4 CommentsThis post may contain affiliate links. 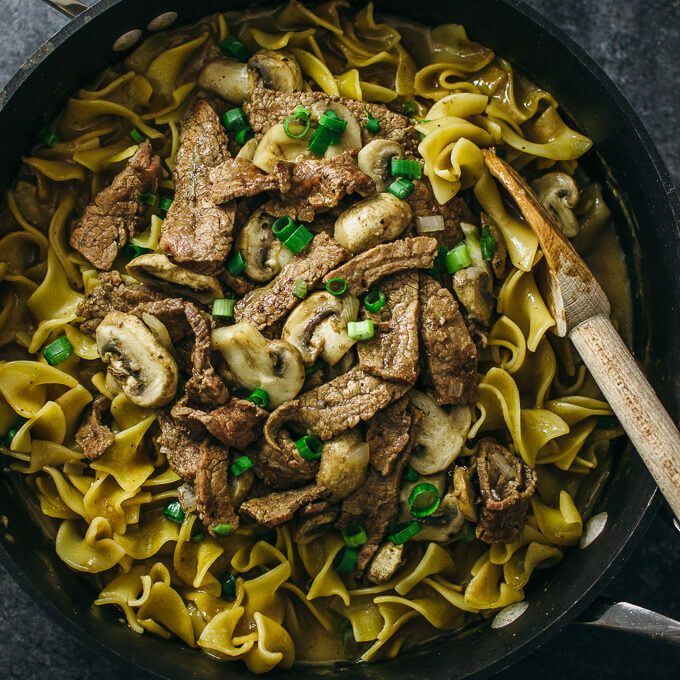 Try this easy version of beef stroganoff with tender flank steak and juicy mushrooms. 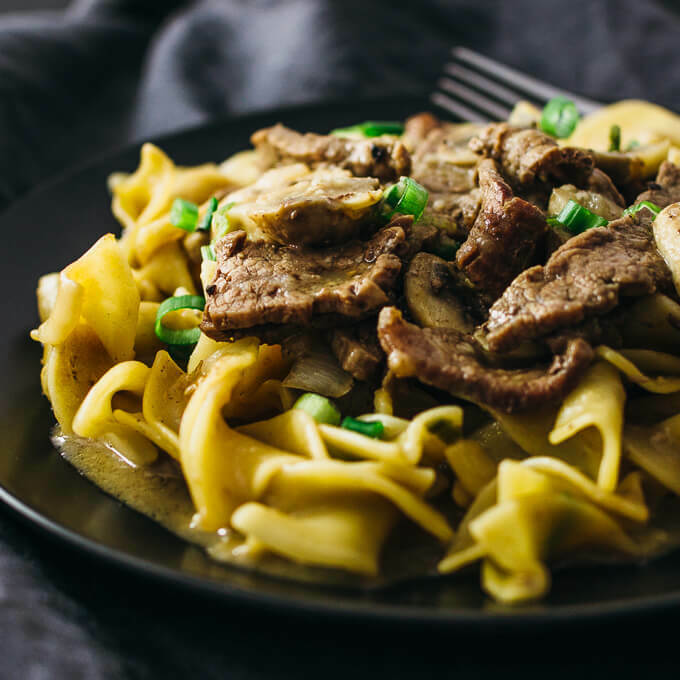 With considerable variations eaten throughout the world, beef stroganoff is such a popular dish that many don’t realize it actually originated in Russia in the 1800s. Some believe that the name of the dish can be attributed to the Stroganov family, who were a family of rich and successful businessmen and statesmen. 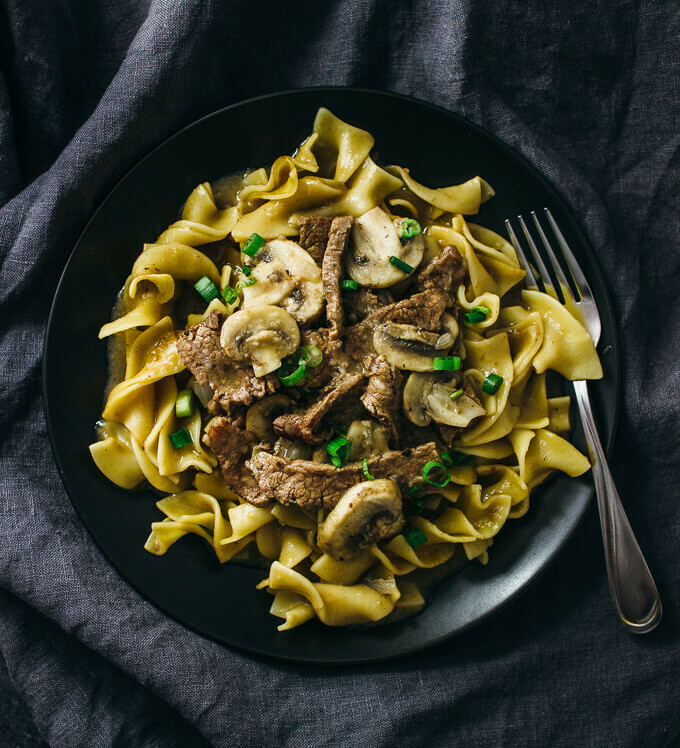 Classic beef stroganoff is traditionally made with sautéed beef and a sour cream sauce, and nowadays most Americans enjoy it over a bed of twisted egg noodles. 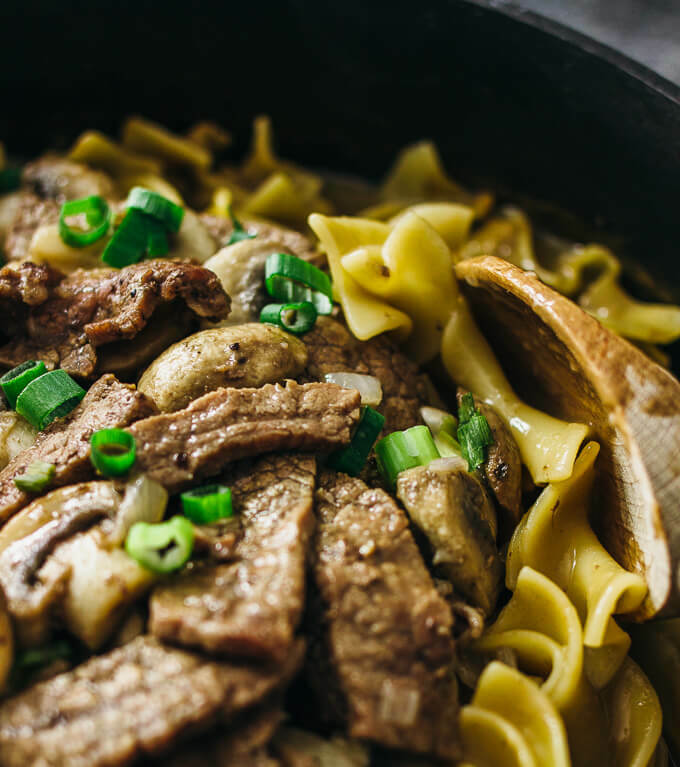 Today I’m sharing my easy version of beef stroganoff — no sour cream involved, thin flank steak as my choice of beef, mushrooms and shallots included, and everything cooks in one pot including the egg noodles. 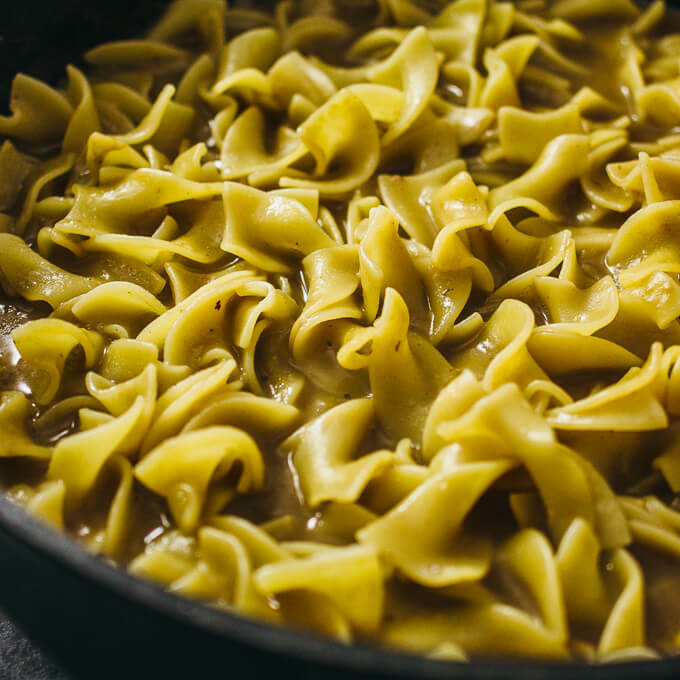 Since everything cooks in the same pot, the egg noodles are not boiled in a separate pot as in most pastas, but instead are simmered in a beef broth mixture until it is cooked through, which takes only about ten minutes. I’m very particular about the aesthetics of beef stroganoff, so I always insist on using egg noodles that are (1) twisted and (2) extra wide. You can find these extra wide egg noodles at large supermarkets including Whole Foods as well as online retailers such as Amazon. The reason that I don’t include sour cream is simply because I’ve never been fond of it. I rarely use it, so I’m loathe to get a small tub of it at the grocery store only to use a small amount and discard the rest. 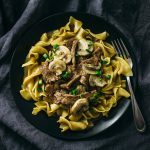 If you can’t imagine stroganoff without sour cream, you can check out my leftover turkey stroganoff recipe that I made for last year’s Thanksgiving. 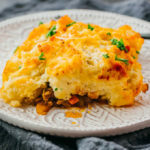 That recipe has a thicker sauce made using sour cream and corn starch, and is great for any kind of leftover meat. Heat olive oil in a 3 quart or larger pan over medium heat for a few minutes. Add sliced steak, salt, and pepper. 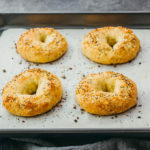 Increase to medium-high heat and cook until browned, about 5 minutes, stirring occasionally. Add mushrooms and shallots to the pan. Cook until the mushrooms soften and shrink, about 5 minutes, stirring occasionally. Turn off the heat. Transfer the pan's contents to a large bowl. Set aside. Melt butter in the same pan over medium heat. 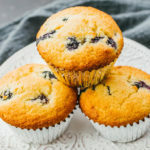 Add flour and constantly stir for a few minutes. Add beef broth and Worcestershire sauce to the pan, stirring until combined and the sauce thickens a bit, about 5 minutes. Add egg noodles to the pan. Bring to a boil over medium-high heat, stirring and gradually reducing to medium-low heat to maintain a simmer. Simmer until the noodles are cooked, about 10 minutes, occasionally stirring. Taste for doneness, adding more broth as needed. Transfer steak and mushroom mixture back to the pan. Cook until the steak and mushrooms are heated through, a few minutes. Garnish with sliced scallions and serve. Nobody had “extra wide egg noodles” or flank steak and I happened to have a 500g box of Barilla fettuccine toscane and a 500g Angus outside skirt steak. I read somewhere that skirt steak is a great stir-fry meat so I’m going to try out this recipe with these ingredients. That’ll work. Let me know how it turns out! Apologies for the late response. I plain forgot. I was mildly surprised at how well it turned out. I will try it again but this time I will brown the steak using burnt sugar à la Créole. I assigned my version four stars as I would be happy to try it again.